(Bloomberg) -- Once again, the day Britain is set to leave the European Union without a deal looms. And once again, pound traders are barely batting an eyelid. Sterling may get a temporary reprieve from the Brexit frenzy if the EU grants the U.K.’s request for a further extension next week, allowing it to extend this year’s best performance among Group-of-10 currencies. 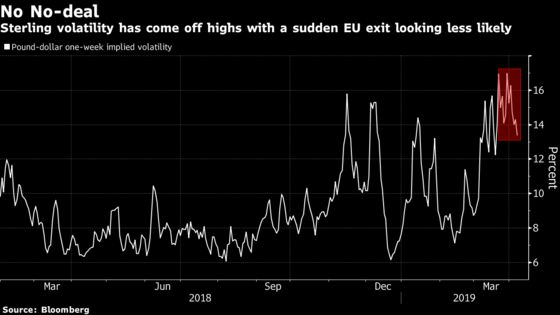 Markets have increasingly priced out the prospect of a no-deal Brexit, with falling one-week implied volatility showing growing investor confidence that the current April 12 deadline will be postponed. The focus now turns to the EU’s emergency meeting on Wednesday, when many strategists see the bloc granting the U.K. a second Brexit extension after deferring it previously last month. 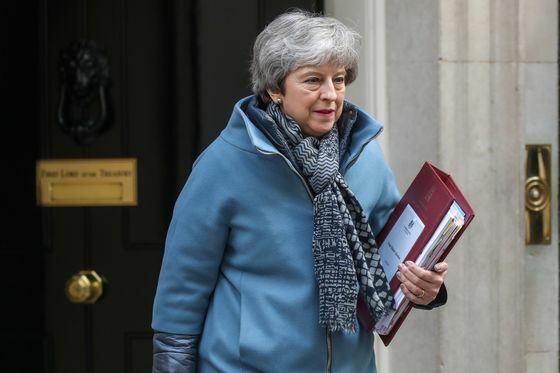 Although U.K. Prime Minister Theresa May has asked for a delay until June 30 and wants to leave even sooner if a divorce deal can be ratified before European elections next month, some analysts predict a longer extension. The U.K. currency has advanced more than 2 percent this year as the market bet against the risk of a chaotic separation. Although the threat of Britain crashing out of the EU without an agreement can’t be ruled out on April 12, one-week pound implied volatility versus the dollar fell to its lowest level since March 20 on Friday. However, for Nomura International Plc, the positive signs are too good to ignore. U.K. lawmakers are expected to complete legislation ruling out a no-deal exit next week, while May is in talks with the opposition Labour Party in an attempt to break the impasse.